With the Clowntown Roadshow BMW E30 out of commission indefinitely with a blown head, I’ve been catching rides as an “arrive and drive(r)” with various teams at west coast races for the past year. I drove a Humber Super Snipe (really) at Sonoma in December, a Volvo station wagon (a really fast turbo one!) 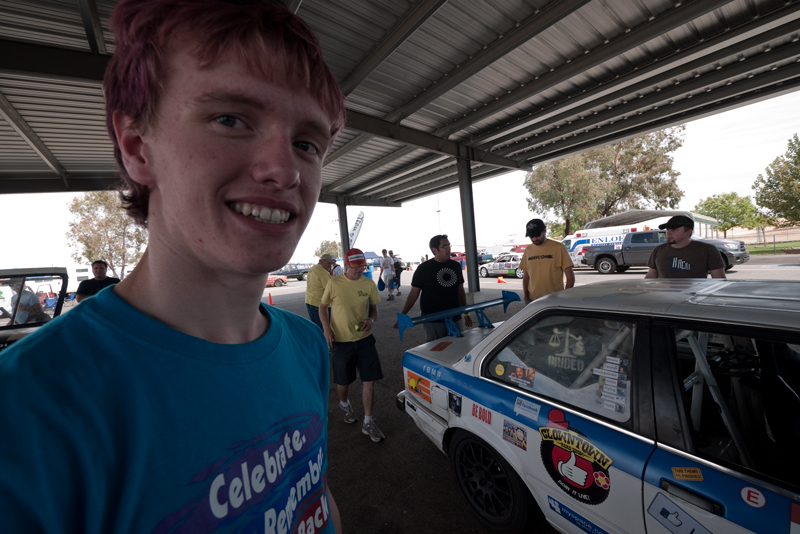 at The Ridge at a “Lucky Dog racing League” event, and with The Flying Scotsmen in their expanding fleet of E30s at Buttonwillow last month. Often times these have been last-minute affairs, that have cost me very little, if nothing beyond travel costs. 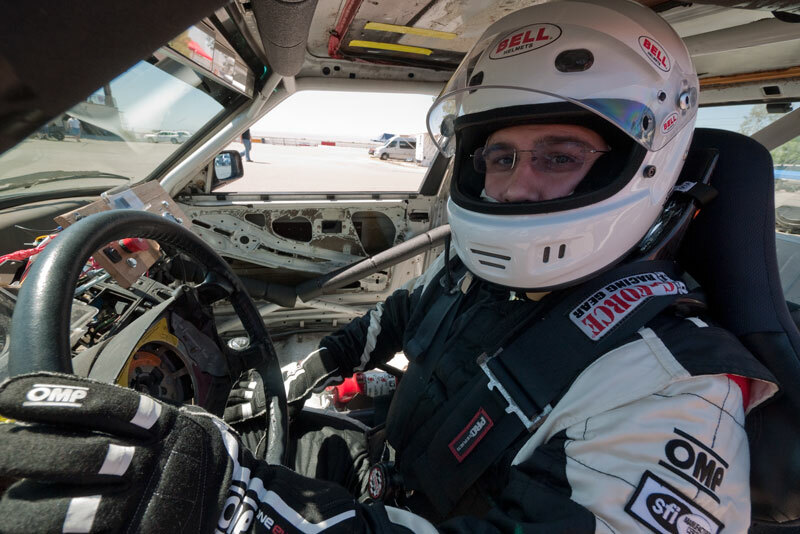 Right after Buttonwillow I check the 24 Hours of LeMons forums and read a plea from a new rookie team for an experienced driver willing to help them out at The Ridge. I reply, and after an email exchange with the team captain, agree to help them out. We swap lots of emails about their car, passing tech, things to bring, things I will bring, track etiquette, the paddock scene, etc. With as much wisdom imparted through ASCII and RFC2822 as possible, the day comes to drive up to Shelton, meet the team, and race. I will post soon about my drive in the “clown car” which was a huge highlight for me, but here are some lowlights from the rest of the weekend with my teammates that pretty much sum up racing at the 24 Hours of LeMons. Another Lemons Race. Another Track. Another Team. Another Car. Racing cars is a lot like smoking crack. One hit of the stuff and you’re hooked – and then you can’t get enough. I’ve loved every minute of racing with my Clowntown Roadshow team mates. However, I’m the sole team member living and working in the Pacific Northwest, with the rest being in Northern California. While I’m very in-touch with my team mates via our Facebook group, and I always volunteer to pull tow-duty on the SoCal races – I miss the weekends wrenching on the car, and have been unsuccessful in convincing my team to think about coming north for events in the northwest. 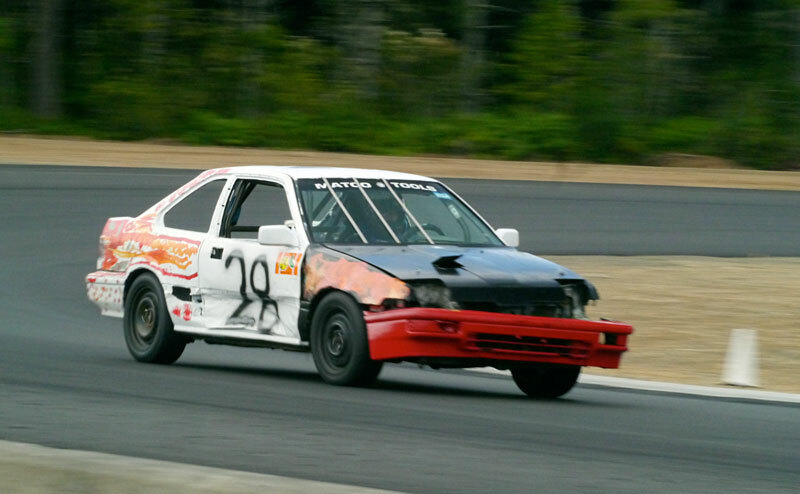 I advertised myself as a “driver for hire” on the 24 Hours of Lemons forums for any team in the PNW planning on running the Pacific Northworst Grand Prix in Shelton, WA. I had a few teams show an interest, but a group of “newbies” from Shoreline, WA seemed the most eager to have me along, so I joined their team. They had a car, and a lot of enthusiasm, but only three drivers. All had young families and hoped to make it a big outing. Nick had his Freshman Orientation the two days before the event, so I brought him along to round out the family atmosphere. The event was at the brand new Ridge Motorsports Park outside of Olympia. Nick and I awoke at O’dark:thirty Thursday morning to drive to Corvallis – spent all day and the next attending welcoming lectures, parental-panic-soothing seminars, class registrations, and advanced placement tests at Oregon State University, before making the dash Friday night (with a stop in Portland for dinner with friends) to Olympia. Saturday morning dawned wet and gloomy – yes we were back in western Washington! We arrived at the track, paid our fee, and lapped the paddock looking for our team. I noted that street cars were lapping the track, and since we could not find our team I steered my car out onto the pit lane and decided to see this new track. Author chuck goolsbeePosted on July 26, 2012 November 24, 2012 Categories Cars, The 24 Hours of LeMons1 Comment on Another Lemons Race. Another Track. Another Team. Another Car. Author chuck goolsbeePosted on July 8, 2012 November 24, 2012 Categories Cars, The 24 Hours of LeMons2 Comments on The Clowntown Roadshow runs a 24 Hour Race! 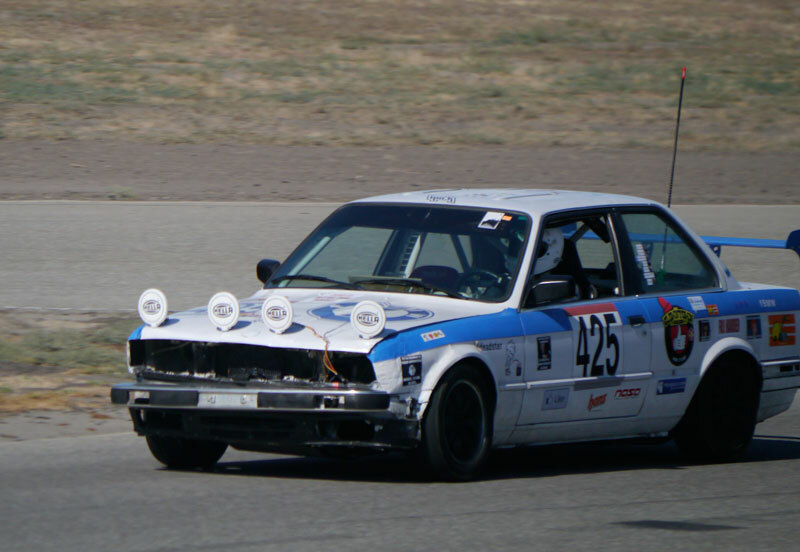 Chuck Goes Racing: The 24 Hours of LeMons. Ever since its inception, I’ve really dug Jay Lamm’s “24 Hours of LeMons” series of car racing. The ethos is all about fun. More importantly, fun on a budget. Car racing is way too serious and way too expensive, but LeMons has changed all that. I’ve wanted to participate since day one at Altamont, but have never had the team, the car, etc. 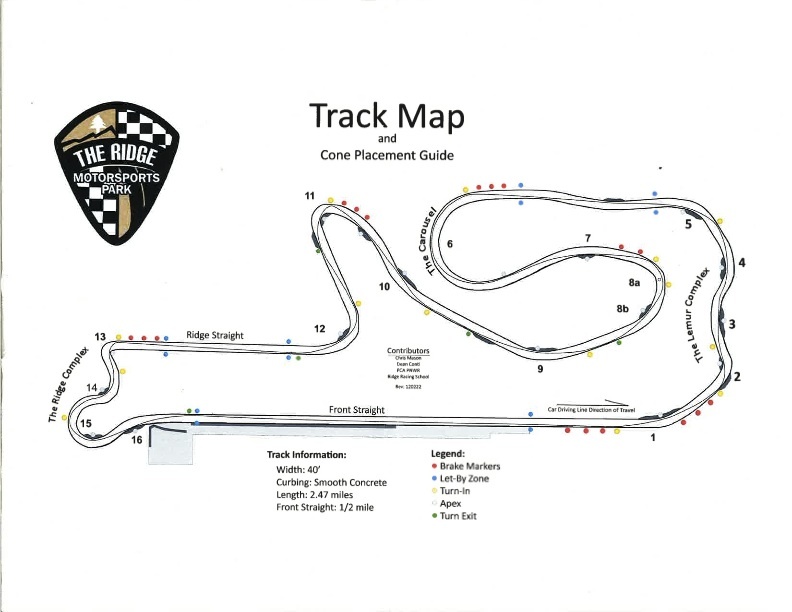 The track was set in “Race #15” configuration, which was a nice mix of speed and hard corners, including a very long back straight (“The Drag Strip”). We had five drivers and six ~2.5 hour shifts to run. I ran the last shift of the first day. Words can not adequately express how awesomely fun it was to drive in an honest-to-god actual wheel-to-wheel race. Yes, there were many cars faster than ours, but we seemed to pass as much, if not more than we were passed. I yelled at d-bag drivers, I made daring passes, I hammered the car to 120 MPH down the straight, and I laughed out loud at crazy cars and insane driving. I had a complete blast. The only incident that marred my track time it was having to pit for gas. I was out, and making progress when I finally glanced at the gas gauge while flying down the long straight at ludicrous speed (I recall Mike Hawthorn describing the 170 MPH Mulsanne Straight as the moment when he could actually relax and think. It is true, everywhere else you’re too busy to look at gauges!) and realized I was almost empty. As I was working through the Esses I thought about pitting, and as I gunned it to pass a car in the short straight before Sunset Corner the gas light came on and I recalled Capt. Kulka saying “if the light comes on, PIT!” so I exited the track to refill the tank. Hopefully we’ll learn to avoid these issues in future races, as it is in the pits where races are won or lost! After the tank was filled the remaining 30 minutes of track time went by in a flash. The setting sun made the infamous Bus Stop corner even harder than normal, but I seemed to master it with a quick stab on the brakes and a down-shift into third right BEFORE the corner, and then carry acceleration through it and into Riverside and the long straight. Being on-track for the day’s finish with the salute from the corner workers as the sun set was awesome – a moment I’ll never forget. As a team we did really well – far better than we had hoped. After Day Two, we finished 27th out of 134 cars – way beyond our hoped-for top-half finish. Each of us stayed very consistent, turning 2:15—2:35 laps, depending upon traffic and yellows. The only real issue we had was a 30 minute penalty on the first shift of Day 2, when one of our guys spun off the track. If we can get out pit stops worked out and stay on-track, we could be quite competitive. This was my very first time driving a BMW. Despite being old enough to legally drink ethanol, and being stripped bare for racing, I found the 325i a joy to drive. Rear wheel drive, reasonably torquey inline six, and a full complement of three pedals made for a real driver’s car. I may seriously consider a Munich Machine for my next daily driver! Stay tuned for more as we run our next races. If you’d like to follow along more closely, see photos and movies, “like” us on Facebook. Author chuck goolsbeePosted on December 10, 2011 December 10, 2011 Categories Cars, The 24 Hours of LeMons2 Comments on Chuck Goes Racing: The 24 Hours of LeMons.